The Cagemate features a powered drive system, eliminating heavy manual pushing. 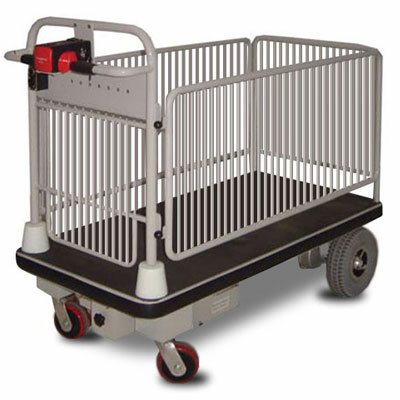 The powered platform trolley with removable cage sides is ideal in laundries, hospitals and large retail companies (unit does not elevate). Fitted with 250 mm diametre semi-pneumatic grey non-marking drive wheels and 125 mm non-marking polyurethane castors. Please note, this unit does not elevate. Removable caged sides – also opens on two sides. Powered drive system – eliminating heavy manual pushing. Suitable for relocating heavy items easily.